My bedroom at the home in Kisaasi. 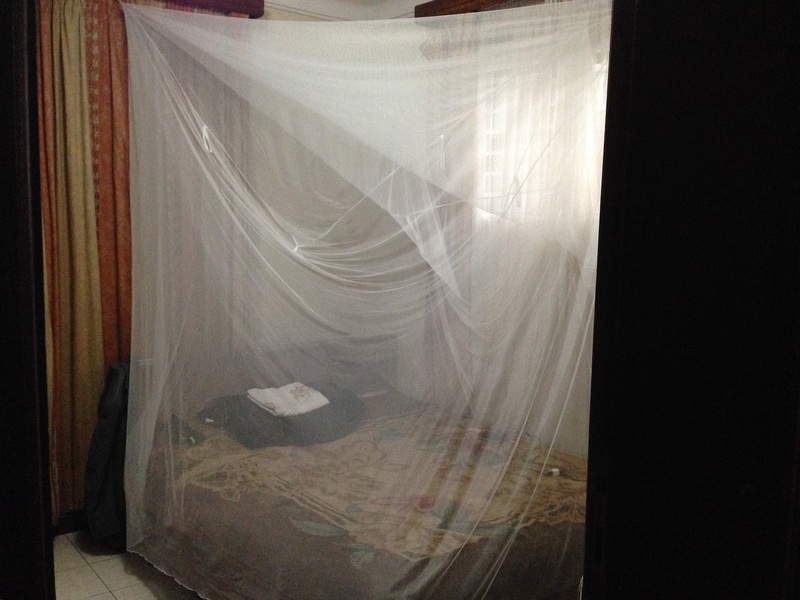 That bed net really keeps the mosquitoes away (learned the hard way by not sleeping under one the first night). While living in the Serena Hotel with the Duke team for a week was truly serene, sorry for the bad pun, my budget wouldn’t cover nightly rate for long. Luckily, my official residence during my time in Uganda was already set up (Thanks, Tu) with a family living in Kisaasi. By sheer good fortune, the directions I gave the driver somehow allowed us to find the residence with only having to take a few U-turns. Having already met the family at the going away dinner for Tu, family members greeted me at the door. Kindly, they offered to help bring in my bags and then gave me a mini-tour of the house and my room. As it was nearing night, they went to bed and left me to set up my room. During the meticulous process of setting up my room, I sat on the bed and reflected. During my reflection I thought about how I was moving into a place where I would feel right at home. I say this because the family I am staying with reminds me so much of my own family back home. Heading the household is Madame Tendiwensi, whom is currently working on her PhD in agro-business and is a lecturer at Makerere University. Her family consists of three boys and one girl all under the age of 20. Also occupying the house is a young man, Nico, whom is like a son, and Pelon who helps around the house. Having this many people in the house means there’s always something happening and it has that warm feeling that large family homes always have. My family back at home consists of my mom, my three sisters and one brother, and other family members from time-to-time, so I feel most comfortable in a house with many people surrounding me. Having lived here now for a little over a week, I can say without a doubt that I feel welcomed into their family. Honestly, I was a little worried about moving to Kisaasi as it is about 15-20 minutes outside of the main part of Kampala where I will be doing most of my work. My main concern being the transport back and forth each day. Let me explain myself thoroughly. Transportation here is available in a multitude of forms: taxi, special hire, boda-boda, private vehicle, biking, and of course walking, so I am not lacking in options. Since these options are a little different here, I’ll take a little time to explain some of them. Taxis are modified mini-van type vehicles that carry anywhere from 10-18 people, and go to every part of the country. Special hires are similar to what our idea of a taxi is back in the states. Boda-bodas are motorcycles operated by drivers who spend their days driving from place to place. Boda-bodas are the fastest way to get around, but also the most dangerous. Prior to my departure, I was instructed by many people not to utilize them. Due to my lack of knowledge of how to use a special-hire, this past week I got back and forth using the taxis. Overall, this was an efficient and cost effective way to get around town. Unfortunately, the taxi drivers temporarily went on strike early in the week and thus I was left stranded until a kind lady picked me up and drove me to my location. With this week under my belt, I feel much more comfortable getting around and my Luganda lessons have helped me to communicate better with the conductors of the taxis. Briefly, the project has been going well. Thus far, we have gotten about 75% of the data from the survey. Complications that we’ve run into so far are phone airtime and data issues, impassable roads, and we actually had one person from our team give birth and another ironically had to have surgery. Most of my time is spent at our “office” in the school of public health at Makerere University trying to help people with these problems in any way that I can. Data analysis and quality control is the other part that takes most of my time during the day. We have a great team that has truly kept this study going smoothly and helped me get fully oriented.